They make you feel cool in summer and are often served in a glass bowl to enhance the cool feeling. They are a snack taken between meals, sometimes as a desert. Sweet brown-sugar syrup is poored over the chilled dumplings. They can be combined with fruit, red azuki beans, ice cream or jelly. They usually imply a snack during the daytime. Most popular is a serving in sweet azuki soup (shiruko). They are made from special flour, Shiratamako 白玉粉. glutinous rice flour. It is quite lumpy when dissolved in water and must be kneaded thoroughly for making dumplings. 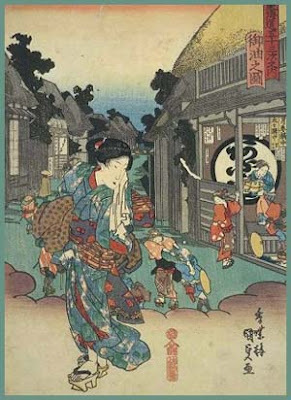 In Edo, these vendors walk along, selling Shiratama and cold water (hiyamizu 「冷水（ひやみず）). The vendor scoops cold water from a well in the morning and starts his business. The dumplings were made of kanzarashiko flour 寒晒粉 (another name for Shiratamako). They were put in a bowl, covered with cold water and some brown sugar then sprinkled on top of them. One bowl was sold for 4 mon. Here comes the cold delight !
. mizu-uri 水売 (みずうり) vendor of water in Edo . 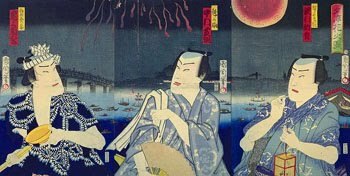 On this woodblock from 1870 by Utagawa Kunichika you can see three men enjoying the firework display at the bridge Ryogokubashi. They are three actors, the name of each one is mentioned. Nakamura Shikan 四代目中村芝翫 and Sawamura 二代目澤村訥升. 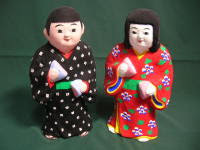 Kikugoro is dressed in the robes of a vendor of Shiratama. 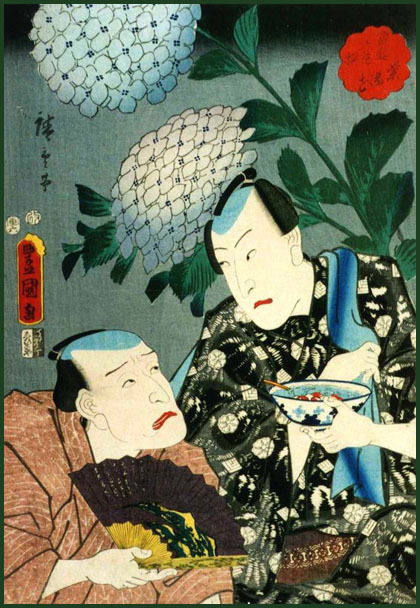 The man on the right is holding a bowl of Shiratama with red dumplings.
. Food vendors in Edo . to see the image and text of Nakamura Sakuo. were Edo period lodgings for travelers at shukuba (post stations) along the national highways, including the Edo Five Routes and the subroutes. 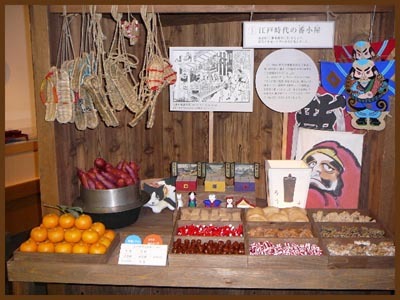 In addition to a place to rest, hatago also offered meals and other foods to the travelers. They were also called hatagoya (旅籠屋). The word itself originally derived from baskets that contained food for horses and were carried by travelers. From there, it became a tool with which travelers were carry their own food and goods. Shops that began preparing and selling food for travelers gained the suffix ya (屋), meaning "shop," but this was eventually shortened to just hatago. Because many post stations along the Tōkaidō, Nakasendō and other historical routes have been either preserved or rebuilt, there are many traditional hatago still in existence today. While some have only been preserved as public buildings and museums, others have continued to operate for the past few hundred years.
. shukuba 宿場　post station, postal station .
. kujiyado, kuji yado 公事宿 lawsuit inn, "lawyers' inn” . Travellers could ask for food being brought by women who would serve them "anything". A good traveller would walk about 40 kilometers (10 ri 里), a woman made about 30 kilometers (8 ri). Goyu was about 298 km from Edo and 195 km close to Kyoto. Now it is in Toyokawa. Of course reservations could not be made in the Edo period. Travellers arrived at any time and stopped when they got tired of walking. A licensed hatago would provide two meals, breakfast and evening meal. Other lodgings (yadoya, yado 宿屋) more popular with the poor travelelrs would only provide the firewood for self-cooking (kichinyado, kichin yado 木賃宿). The cost was about 3000 yen (300 mon) for a hatago. A yado would charge about 500 yen (50 mon). Travellers would often have to share a simple room with others. 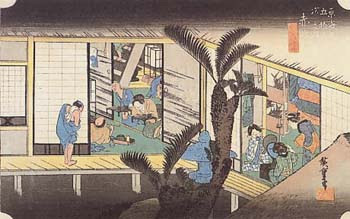 When entering a hatago, travellers could wash their feet in a wooden basin (tarai たらい) and sometimes a woman servant would carry their luggage up to a room. Some hatago would provide local delicacies to entertain the travellers with food and local sake. Some where quite famous for this, for example in Odawara they served kamaboko fish paste. One meal consisted of a pot of soup, two sidedishes of vegetables and rice 一汁二菜. The price varied with the quality of the food. .Toyokawa Inari Shrine 豊川稲荷 i .
Hiratsuka is still quite close to Edo, only about 60 kilometers on the road. It was a stop at the crossing of river Banyuugawa 馬入川, now Sagamigawa. For a slow traveller, Hiratsuka was the second stop-over on the trip. Here you can see the servants carrying trays with food. The smaller girl carries the pot with cooked rice (meshibitsu 飯櫃). On the tray there are a bowl of soup, a bowl for rice, a plate with a fish (fried or boiled fish was common), a covered bowl with cooked vegetables (sometimes even lily roots or yuba soy skin, shiitake mushrooms) and a small plate with pickled vegetables. This is quite a delicious evening meal. Fish was not served in the morning.
. Reference : 旅籠 in 江戸 . Many ryokan take great pride in a long history of "motenashi no kokoro" おもてなしのこころ, entertaining the guests with utmost care.
. sankin kootai 参勤交代 Sankin Kotai Daimyo attendance in Edo . to bus as much cakes as you could get for that amount of money. sodedome 袖止（そでどめ） "shortening the sleeves"
The emperor Ninmei にんみょうてんのう【仁明天皇】 (833 - 850) once had an inspirational dream on the 16th day of the sixth month, when the Gods told him to offer 16 sweets to prevent him from getting ill in summer. The period name of this dream was kajoo 嘉祥, which was then used for the offerings. The emperor Gosaga ごさがてんのう【後嵯峨天皇】 (1242 - 1246) was initiated as Emperor on the 16th day of the 6th month and had food purchased for 16 coins of the Kajo-period.
. Go Saga Tenno 後嵯峨天皇 (1220 - 1272) . 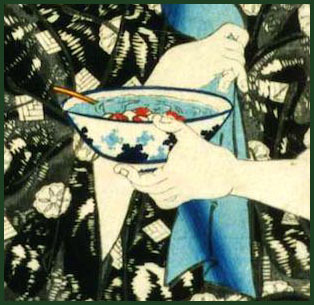 This more popular food ritual started in the Muromachi period. On the 16th day of the 6th month, people at the court (and later the common folk) would eat 16 different pieces of small rice cakes (mochi) and sweets to ward off infectious diseases (ekibyoo 疫病). These cakes were first put on the God's shelf as an offering and later eaten. 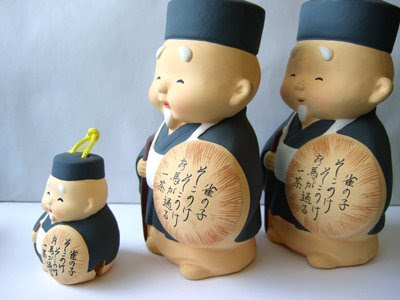 In the Edo period, this evolved so that each regional lord gave sweets to his retainers. Poor people bought sweets for 16 mon coins and all had to eat them without laughing while eating. 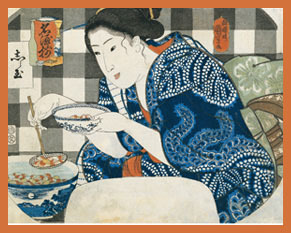 During the Edo period, sugar was introduced via Nagasaki and more sweets could be produced. In the great hall of Edo castle, with 500 tamatmi-mat size, more than 20000 pieces of cake would be placed and the Shogun gave them to his retainers. This is also a play of words with katsu 「嘉通」and 「勝つ」, to win. In the Edo period, it was custom on this day to sew the sleeves of young girls of the age of 16 to a shorter lenght (sodetome そでとめ【袖止め／袖留め】 ). This showed they were now ready to do the work of a woman. During the Meiji-Restauration, the practise of giving Kajo-cakes to retainers was abolished. But in 1979, it was kind of revived by the sweet makers industry. Nowadays, the 16th of the 6th month is also the day of Japanese sweets. Fourth Month, 14th day, a son, Sentaro, is born. Fifth Month, 11th day, he dies. Fifth Month, 4th day, a daughter, Sato, is born. Sixth Month, 21st day, Sato dies of smallpox. Tenth Month, 5th day, his second son, Ishitaro, is born. First Month, 11th day, Ishitaroo suffocates while bundled on his mother's back. Third Month, 10th day, his third son, Konzaburo, is born. Fifth Month, 12th day, his wife, Kiku, dies. is eaten by the mother . . . This would mean the mother ate cakes for 32 mon worth of money. Maybe the baby was still too small to eat the cakes and mother tried to "eat good fortune" for both of them. "fried on a metal gong"
In Japanese, dora 銅鑼　is a gong and its shape is similar to that of the sweet cake. Legend tells that the first Dorayaki were made when Benkei forgot his gong when leaving the home of a farmer,who had hid him in the barn. The man later used the metal gong to fry his pancakes, thus the name Dorayaki. Dorayaki (どら焼き, どらやき, 銅鑼焼き, ドラ焼き) is a type of Japanese confection which consists of two small pancake-like patties made from castella wrapped around a filling of sweet red bean paste. It originally only had one layer, and the current shape was invented in 1914 by the Ueno Usagiya うさぎや. In Kansai area, such as Osaka or Nara, this sweet is often called mikasa（三笠焼き）. The word originally means triple straw hat, but also an alternative name of Mount Wakakusa 若草山, a low hill with gentle slope located in Nara. Many local people picture the shape of this hill while eating a mikasa. In Nara, a larger mikasa of about 30 cm in diameter is famous.
. Mount Mikasa 三笠 - Wakakusayama 若草山. 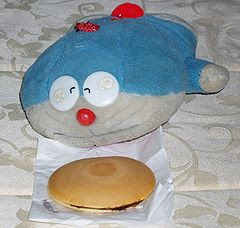 The Japanese manga and anime character Doraemon loves dorayaki, and it has been a plot device several times throughout the series. This is a kind of pun, though his name comes not from "dorayaki" but from the word "doraneko" (stray cat.) 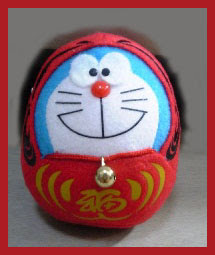 Since 2000, the company Bunmeido 文明堂 has been selling a limited version of dorayaki called Doraemon Dorayaki every year around March and September. 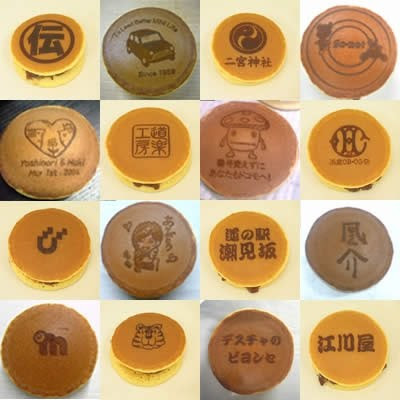 They have succeeded to sell their dorayaki to many parts of the world. The cakes are baked in a huge bakery and shipped worldwide. They are also available in many stores in Japan, where daily delivery is a must. The perfect gift for lovers ! kuridora. Sometimes a whole chestnut is embedded in the cream. namadora, nama dora 生どら "raw dora"
With a diameter of 30 cm and weights 2 kg. A present for a wedding or birthdayparty. You can even order a special inscription made from white chocolate on the front side. "Full autumn moon at Mount Ishiyama"
Kasutera is a corruption of pão de Castella or Castile bread (Castile is a province of Spain). It was introduced by the Portugese missionaries via Nagasaki.
. WKD : The Bible and Haiku . chuugen 中元 "Middle third of the year"
Joogen, Chuugen and Kagen in the Asian calendar. Traditional Japanese confections, or wagashi, can take a little getting used to for Western palates: The sticky-gooey texture of mochi (pounded rice) and the sweet an (bean paste) filling that are often used are quite different from most European-style cakes and cookies. But one snack that may suit the wagashi beginner is dorayaki. A dorayaki is a palm-size treat comprising a sweet filling sandwiched between two round cakes that are similar to American pancakes. Out of favor for some years like all wagashi, dorayaki have become quite trendy again as part of an overall wave of nostalgia for foods from the Showa Era (1926-1989). Manga and anime fans may know it best as the favorite snack of Doraemon, the blue robotic cat with the magical pocket. The name "dorayaki" comes from the Japanese word for "gong": dora. This is usually believed to be simply due to its resemblance to the circular metal percussive disk, albeit in miniature. (The yaki part of the name means "cooked on dry heat.") But there is another, more romantic theory for its origin that involves a legendary hero called Saito no Musashibo Benkei, sidekick of Minamoto no Yoshitsune. The story goes that once when he was seriously injured, Benkei was taken care of by an elderly couple who served him a little round cake cooked on the surface of a gong, thus creating the first dorayaki. Although the origins of the dorayaki are believed to be ancient, it only took its current form in the early part of the 20th century. During the Edo Period (1603-1867) a dorayaki was a folded-up cake, like an omelette or pasty rather than a round sandwich, and the dough was much thinner. It was first made as a sandwich using fluffy cakelike pancakes in 1914 by a confectionery in Ueno, Tokyo, called Usagiya (Rabbit House), whose owner took the idea from another confection that has its roots in Europe, the kasutera or castella cake. Like kasutera, the batter used to make a dorayaki pancake has some very Japanese ingredients in it, such as mirin (sweet rice wine) and even a touch of soy sauce. The main sweetening ingredient is usually honey, although sugar is used sometimes too. While the usual dorayaki filling is tsubu-an (sweetened and mashed adzuki bean), in recent years all kinds of different fillings have become popular. One of these alternatives is called a nama (fresh or raw) dorayaki, referring to the use of fresh cream — in this case, whipped cream with some tsubu-an mixed in. Other fillings include chocolate cream, sweet potato cream and chestnut cream — the type that comes on top of a Mont Blanc cake, another only-in-Japan confection. Making your own dorayaki with the filling of your choice is quite easy, especially if you use one of the instant pancake mixes that are so popular in Japan. Just add a couple of tablespoons of honey, a tablespoon of mirin and a drop of soy sauce to the batter. Cook on a nonstick surface such as an electric griddle, and fill when cooked with any sweet, spreadable filling. My favorite is Nutella with sliced strawberries, for an intriguing East-meets-West snack.
. Snacking , a snack (oyatsu, o-yatsu 御八つ) . akagai あかがい【赤貝】 lit. "red clam"
It lives on the muddy bottom of shallow inlays. Its liquid is bright red like blood. Its edible parts are the "tongue" and the "thread" (akahimo　赤紐), also the liver. From Yuriage 閖上（ゆりあげ) near Sendai, this is the best from Japan. The fishermen in Yuriage port only take out big ones and make sure not to overfish. Caught in the morning for four hours during the season in April and May, they are shipped and sold at Tsukiji market in Tokyo next morning. Later in the year, akagai come from Ehime. Th black liver is especially taken out and prepared raw, boiled or fried. During the Edo period, when rich folk and samurai started to eat white rice, this akagai was their only source of vitamin B.
Kubota Mantaro, the Haiku Poet died on 6 May 1963 at the age of 73, of food poisoning, after eating an akagai clam at a party held by Ryuzaburo Umehara. 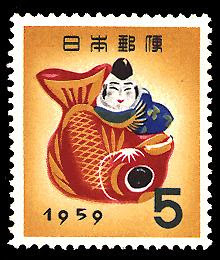 The first Kanji character ‘虫甘’ means ‘赤貝(akagai), ark shells”. . . lit.虫甘 "insect that tasts sweet", an old Chinese character 蚶 for the ark shell. According to the Kojiki account, the two deities dispatched by Kaminusuhi to resurrect Ōnamuchi after his eighty brothers had killed him with a heated rock. Kisagaihime gathered shavings from seashell and Umugaihime mixed them with the juice from a clam, applying them "as mother's milk" to the burns and thus reviving Ōnamuchi. Kisagaihime personifies the ark-shell (akagai). As a result, this story appears to involve the mythic iteration of an ancient folk remedy, in which grindings from the ark-shell were mixed with the juice from the cherry-stone clam to produce a treatment for burns. In Japan it is often sold in cans. 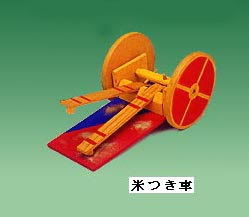 The type saruboogai サルボウガイ is used. The red meat is cut slightly (kazari boochoo) to make the meat better chewable. Together with white ika squid it gives an "auspicious meal" for festivities. Prepared for festivals and celebrations. In the mountains prepared with mountain vegetables, along the coast with red ark shells (akagai). Toward the 18th century, this mysterious disease started as an affliction of the rich and wealthy, who could afford to eat polished rice, which let to vitamin B deficiency. Poor townspeople in Edo, who ate brown rice, did not get it, also the poor in the countryside. Even the 8th Shogun Yoshimune suffered from it for a while, until his cooks gave him a sidedish with the ark clam in miso-vinegar. The ark clam contains a lot of vitamin B. Once the Tokugawa Shogun established the government in Edo (the former name for Tokyo,) the city attracted people and merchants, drawn to the new capital. Edo is thought to have been the largest city in the world at that time. There was a saying at the time that “Fires and brawls are the flowers of Edo.” Vast numbers of people migrated into the city as workers. The new arrivals were poor but healthy while Edokko or people who had lived in the town for several generations were suffering from “Edo Wazurai,” or beriberi. Soba turned out to be the prevention and cure, the secret that had protected the newcomers. Beriberi is caused by a deficiency in Vitamin B. Rich people could afford polished rice; the poor ate whole rice or soba cheaper but much more nourishing. So Edo Wazurai became a condition among the rich. 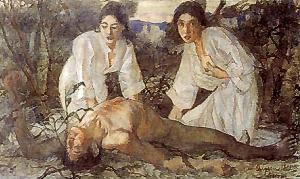 The actual cause of beriberi was unknown until the mid-20th century. Japanese Imperial Army doctors who studied in Germany believed it was the result of bacteria, while Navy doctors studying in England believed the cause was a dietary deficiency and proposed equipping the entire Imperial fleet with baking ovens. This did not, in the end, go forward because of budget constraints.
. . . CLICK here for Kagurazaka restaurant Photos ! is a trendy neighbourhood in Tokyo, near Iidabashi Station. It is also widely regarded as an important center of Japanese cuisine within the Kanto region. Several old and famous "ryotei 料亭" are to be found in the winding back streets, often accessible only by foot. These ryotei provide expensive "kaiseki" cuisine, which is generally regarded as the pinnacle of Japanese food. Ryotei also allow diners to invite geisha to provide entertainment during the course of the evening. 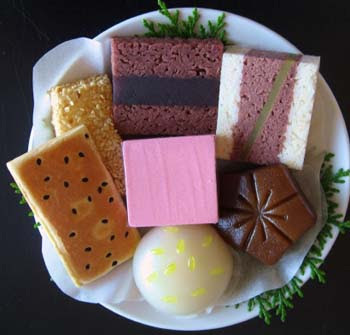 A handmade type of wafer with white shiroan bean paste. 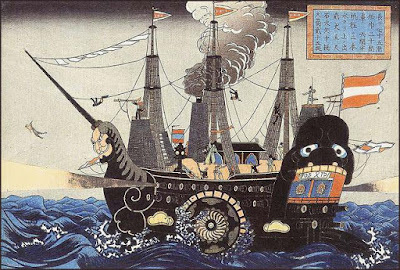 The Black Ships (in Japanese, 黒船, kurofune) was the name given to Western vessels arriving in Japan between the 15th and 19th centuries. 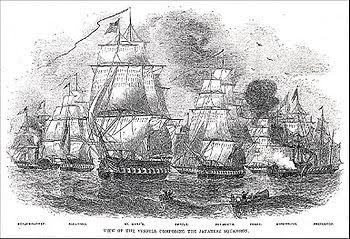 In particular, it refers to Mississippi, Plymouth, Saratoga, and Susquehanna, that arrived on July 14, 1853 at Uraga Harbor (part of present-day Yokosuka) in Kanagawa Prefecture, Japan under the command of United States Commodore Matthew Perry. The word "black" refers to the black color of the older sailing vessels, and the black smoke from the coal-fired power plants of the American ships. 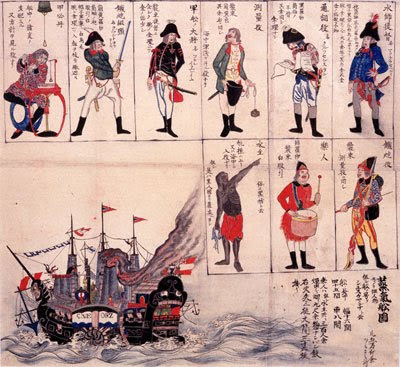 Commodore Perry's fleet for his second visit to Japan in 1854. 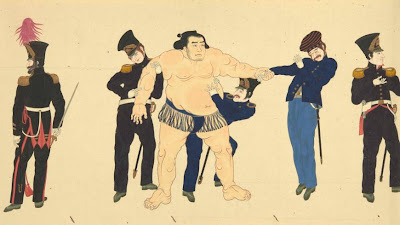 The following year, at the Convention of Kanagawa, Perry returned with eight ships and forced the shogun to sign the "Treaty of Peace and Amity", establishing formal diplomatic relations between Japan and the United States. Within five years, Japan had signed similar treaties with other western countries. The Harris Treaty was signed with the United States on July 29, 1858.
one can't sleep even at night. to make us lose sleep at night. The year of Perry's return visit saw more than its share of major earthquakes. In addition to Odawara, two magnitude 8.4 earthquakes with offshore epicenters shook a vast area along the Pacific coast of Japan on consecutive days. The Ansei Tokai Earthquake shook a region extending south from the outskirts of Edo to Ise Bay Ise Bay on the fourth day of the eleventh month. The next day, the Ansei-Nankai Earthquake shook a wide area of the coast further south, centered approximately on the Osaka. Both earthquakes generated tsunamis, the first of which severely damaged the Russian warship Diana, which had sailed into Shimoda (near Yokohama) to negotiate a treaty. Estimates of the death toll from each quake vary, but 3,000 apiece is a typical figure. When Edo shook in 1855, prominent bakufu official Matsudaira Shungaku (1828-1890) reacted in part by writing a memo to Abe Masahiro (阿部正弘 (1819-1857), the de facto leader of the bakufu. Matsudaira listed recent earthquakes, other natural disasters, and the unwelcome visits of American, Russian, and British naval vessels. Together with the present disaster in Edo, these events "definitely constitute a heavenly warning," he concluded. 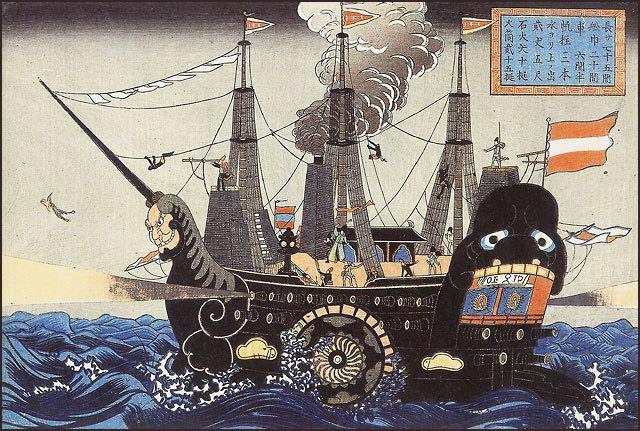 The Edo popular press and the namazu-e also retroactively linked the Ansei Earthquake with the series of severe earthquakes going back to 1847 and the recent arrival of Perry's so-called "black ships. Prevented by censorship regulations from stating the same explicit conclusion as did Matsudaira in his memo, the popular press and makers of namazu-e left such conclusions to readers' imaginations. 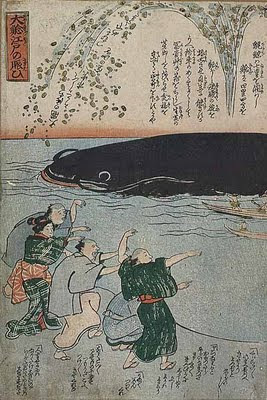 Edo society and the 1855 catfish picture prints. And with that, he takes out a compact bundle, loosens the silk cord around the worn cloth cover, and lays the Japanese section’s latest, almost half-a-million-pound (¥75 million), acquisition gently down on the table and starts unrolling it. I have my dictaphone running, and when I listen back there’s almost a minute when I’ve gone completely silent as I watch Clark reveal this treasure — which goes on display to the general public on April 18. The piece is a jawdroppingly fine, 15-meter-long handscroll depicting the arrival in Japan of Commodore Matthew C. Perry and the nine famous black ships in February 1854. It was Perry’s second visit, and culminated in the signing of the Convention of Kanagawa on March 31, which effectively ended Japan’s centuries of sakoku (closed country) diplomatic seclusion. Clark’s scene-by-scene commentary, as he rolls the scroll up at one end and out at the other, is likely just how the scroll would have been used by its first owner. Notably, there is no explanatory text in the scroll itself, just an introductory preface. This suggests that the scroll’s owner was someone who needed no explanation — in other words, someone who was present at the events depicted, and would tell the story himself to the favored guests who were permitted to view the work. So who was that owner? And, indeed, who was the artist? These are, it turns out, two more of the things we don’t precisely know about this remarkable piece. Maruyama’s own identity is also vague — after all, the name is not uncommon. But one of Clark’s Japanese correspondents showed him a poetry diary entry for 1858 — the year of the scroll’s completion — in which Chinzan goes mountain climbing with a Mr. Maruyama. The diary locates the pair inside the Matsushiro fief — one of the two tasked with Japan’s national defence, as shown in the scroll’s opening scenes. From April 18, for six months, the scroll will be displayed at the center of the gallery, a few meters visible at a time — repeat visits will be necessary to savor the full magnificence of the piece. The theme of the surrounding gallery exhibition, “The Making of Modern Japan,” provides excellent context — there are, for example, lithographs that comprise the American record of Perry’s visit. And herein lies the historical value of the scroll — for the insight it gives into Perry’s visits as viewed by the Japanese. We’re used to a narrative of shock and awe: the Americans arriving by steamship, Commodore Perry dropping not-so-subtle hints about the offensive capability of his shell guns. The scroll tells a very different story: American officers inspect the chinaware at the treaty banquet, sneak food out in their hats to share with those too junior to attend, have their hand wrung painfully by a sumo wrestler. 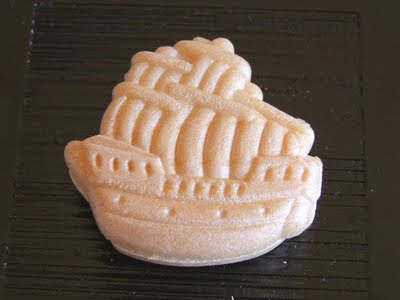 was the Commodore of the U.S. Navy who compelled the opening of Japan to the West with the Convention of Kanagawa in 1854.
. Mingei みんげいクッキー Folk Art Cookies .
. gangu 玩具伝説, omochcha おもちゃ toy, toys . are depicted with food items. Many are made of clay (tsuchi ningyoo　土人形), or straw. Here I will collect them as I find them. 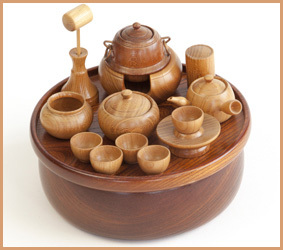 They are also made in Hakone, Kanagawa and other famous woodcarving areas. First made by the carpenters of the Nikko Toshogu shrine, in their free time. 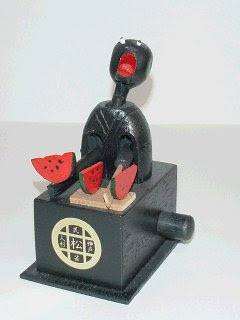 The wood mainly used is from cherry trees, Chinese quince and zelkova.
. Tochigi Folk Art - 栃木県 . 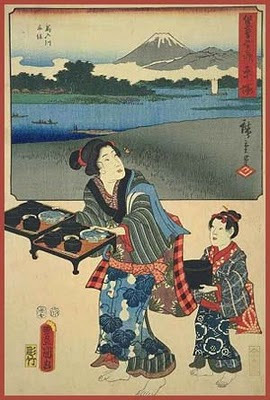 Mostly figures of women picking tea, about 5 to 10 cm high. Some are without colors. They have been produced since the beginning of the Edo period, when Kanamori Soowa 金森宗和 (1584-1656) Kanamori Sowa started carving a statue of the tea master Sen no Rikyu, who got his tea from Uji. Carved with one knife (ittoobori), some are almost like netsuke. Here he is sitting on a sea bream (TAI 鯛) for additional good luck. TAI is related to MEDETAI, an auspicious occasion. Ebisu and Daikoku are usually pictured together. the bounty of the sea and the mountains ! 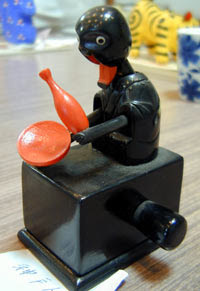 Karakuri ningyō are mechanized puppets or automata from Japan from the 18th century to 19th century. The word karakuri means a "mechanical device to tease, trick, or take a person by surprise". One is sifting flour, one is rolling the dough and one is eating the noodles. They move their arms.
. Karakuri ningyoo からくり人形 mechanical dolls . This is a kind of KARAKURI doll.
. Kobe mechanical dolls 神戸人形 Introduction . Many craftsmen of the area made furniture. These toys were made in memory of Kyoto, since many had fled here after the Battle of Dan-no-Ura, when the Heike were defeated in 1185. A boy holds a bun broken in two halves, to show he loves his father and his mother equally. When asked whom he loved more, father or mother, that was his way of showing it. He broke the bun in equal halves and asked: "Which tastes better?" 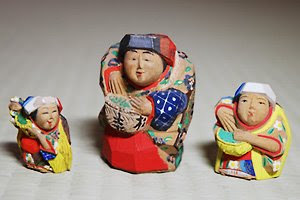 Now these dolls are bought with a prayer to become pregnant and have such a clever child.
. Mingei Kukkii　みんげいクッキー　Mingei Folk Art Cookies - Manju . Here are some more clay dolls with Manju buns.
. Folk Toys from Kyoto . This one is putting down his hat to collect rice grains left in the field. 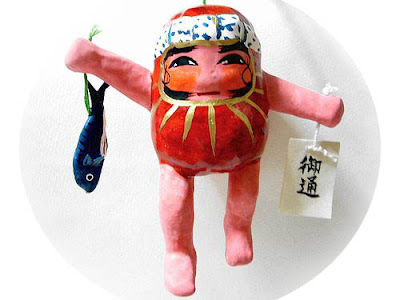 Other dolls are making dried plums, fermented soy beans or ricewine.
. Folk toys from IBARAKI / IBARAGI . TAI is related to MEDETAIめでたい, an auspicious occasion. 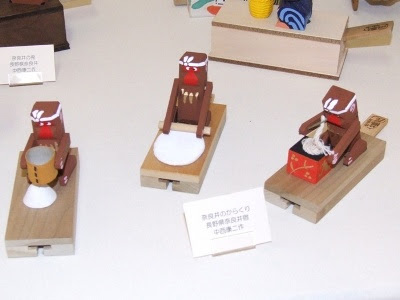 They are made from papermachee and straw and sold at the local Nishi no Miya shrine. clay bell with festive sea bream . pinpin tai ピンピン鯛 sea bream "alive and kicking"
There are many types in Japan. Some are clay bells. They are important auspicious items to thank for a good harvest. During the winter months, many things were made from rice straw. Mostly necessities like sandals, raincoats and hats, but also some toys and auspicious decorations with rice barrels. O-chichi ga taranuka? — o-mama ga taranuka? Sleep, sleep, sleep, little one! Why does my baby continue to cry? Is the honorable milk not enough? is the honorable rice not enough? and all you want ! There has been a boom in cooking toys in Japan. Those toys are so attractive that even adults buy them for themselves. Some of popular cooking toys are Takara Tommy's taiyaki (traditional Japanese fish-shaped cake) makers and soft caramel candy makers, Sega Toy's ice cream makers, and Bandai's norimaki (sushi rolls) makers. Using cute cooking toys, both kids and adults can have fun at home. International Tokyo Toy Show 2009 .
a doll used for making a wish to kill or harm a person. At midnight, a nail is hit through the heart of the doll to fix it to a tree in a shrine. ushi mitsu, the old double-hour of the ox beginning at one o'clock. mitsu signifies the third part of this time slot. A time when the spirits of the dead and the gods are alive too. "a time when the trees and plants are asleep"
***** . Regional Folk Toys from Japan .
. hassaku dango no uma 朔だんご馬/ 八朔団子馬 horse offerings for Hassaku .